Two shop window manikins who have found “true love” have been married in a wedding stunt dreamed up by two North Yorkshire business. 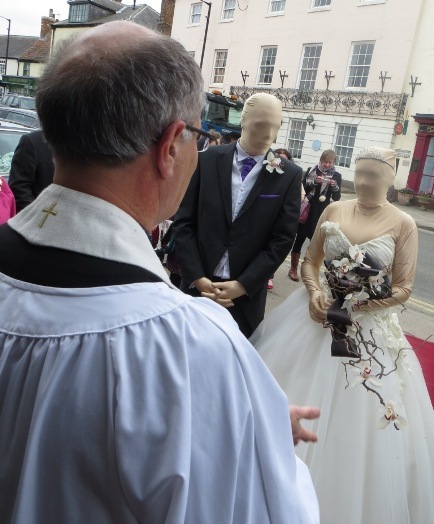 The Rev Philip Smith of St James’s Church in Boroughbridge officiated at a short ceremony outside the town’s award-winning Crown Hotel after which the “happy couple” returned to their respective spots in the windows of the two shops. Love blossomed when wedding gown boutique Curvy Bridal and gents’ outfitters Joshua Adams found themselves neighbours on Horsefair in the town at the beginning of the year. The two businesses are now conjoined as one – so the wedding between the “model couple” has the blessing of both. Representatives from other companies from the region’s wedding industry also attended the ceremony, along with the Mayor of Boroughbridge, Coun Liz Vose, and leading members of the local business community. The “newlyweds” were even given the use of a Bentley by wedding venue Goldsborough Hall for a short journey back to the Joshua Adams store, where they took part in a traditional cake-cutting ceremony as guests enjoyed light refreshments and a performance by guest magician Mark Waddington. However, after a short celebration, the couple were soon back to their normal duties, assuming positions in their respective shop windows. Although it was the wedding of two shop manikins, it was a moving ceremony – and perhaps in more ways than one. We’re delighted so many of our partners in the wedding industry were able to give up a bit of their day to join in the celebrations and – who knows – maybe the event has helped lay the foundations for more business relationships in the future. As for the happy couple, I’m sure there will be plenty of opportunities for them to meet up and spend time together in future. We have a list of wedding fairs and events in our diary for the rest of the year and I’m sure they’ll have a role to play helping us to model our clothes – both for other happy couples getting married of for ladies or gents attending balls, proms or other society events.